We all want a comfortable relaxing feel in our bedroom, but this is a room that should also be romantic. 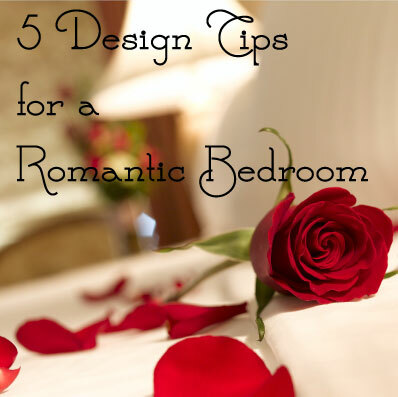 When you hear the word romantic many think of reds, pinks, pastel colors, and candlelight, but you are not tied to the stereotypical idea of romance when designing your space. I bet 9 times out of 10, if that bedroom is shared by a man and a woman a lot of the previously mentioned colors would be vetoed anyway. Most men do not want a pastel pink bedroom. You actually do not need any of those things in the room to have it feel romantic. Romance is a feeling that can be created in other ways. Create Drama – Adding drama to a space adds a more romantic feel to it. Choose a bold, saturated wall color. Think gorgeous jewel tones or a deep, smokey grey. Choose something that is eye-catching and unexpected. Another way to add drama is with a bold patterned wallcovering placed on the wall behind your bed. Set the Mood – Lighting is important. First of all ditch the light attached to a fan (those never provide great lighting) and get rid of the fan if you don’t need it (I live in Arizona where fans are pretty much a necessity). Choose tall lamps to sit on the nightstands on each side of the bed or adjustable arm wall sconces if you like to read in bed. Make sure to use 3-way bulbs or set the lighting on dimmer switches so you can control how much light is entering the room. Keep the light soft, too white of a light is too harsh in a romantic setting and too yellow of a light is very unflattering. Choose something as close to natural daylight as you can. For an added touch, choose lampshades with a soft rose color on the inside (the only place I am suggesting even a hint of pink). You won’t see the room as pink, but the slight change in color will add a romantic glow to the space and it makes everyone look just a little bit better too. Make it Inviting – Pay attention to the materials you choose. You want to, want to come into the space. Choose fabrics that look touchable and make sure they really are. If you have room for a sitting area, choose pieces that are actually comfortable to sit in. You do not want a chair that is too large, but you don’t want one that is too small either. Make sure it is something you can curl up in to read a book. If you do not have room for a sitting area then choose an upholstered headboard to help make the bed more inviting and comfortable to be in. Add some Glitz and Glamour – Add some sparkle to the space. Choose a crystal chandelier to hang over the bed or crystal sconces to hang on the wall. A mirrored nightstand is a great way to add glamour to the space. If mirrored furniture isn’t your thing then make sure you have a mirror. Choose something with a metal frame and ornate details (we love gold!) and place it in a spot you will notice it upon entering the room or across from windows so it reflects light into the space. Play with Texture – We can’t say it enough, play with texture! Texture is your best friend. It adds interest and dimension to a space. If you choose the right textures it also helps to make it more inviting as well. An easy place to play with texture is in the bedding. Choose pillows in different textures, add a soft throw to the end of the bed, mix up the fabrics you choose. Think luxurious and touchable. Silks, chenille’s, velvets, or cashmere. Mix it up to add interest and even more romance to your space.